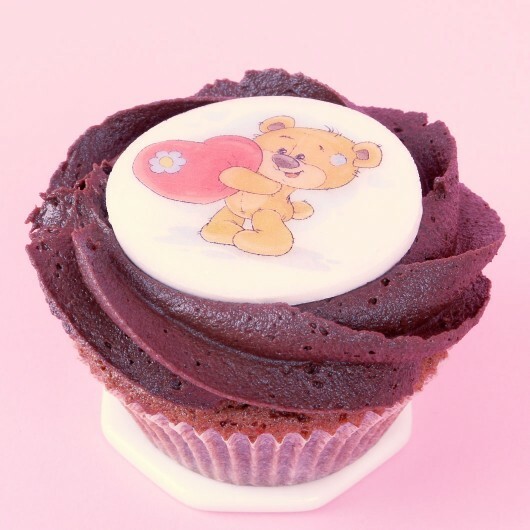 This Teddy Bear is a sweet-talker of a cupcake. 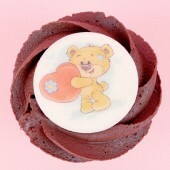 Especially for the times when you want not only to give a small cake as a gift, but also to send in the warmest carress. It's for the people that make up the most special part if your heart, that you want to gift them something kind, delicious, and unforgettable. Something that would bring them back some sweet careless childhood memories, at least for a little while. Ingredients: Cow's butter, powdered sugar, white sugar, eggs, white flour, cocoa, cow's milk, baking powder, salt. Decoration: fondant, glaze, edible wafer paper, food colourings. Nutrition Facts. Amount per 100 grams: Energy 1942.8 kJ/464.3 kcal. Fats: 24.5 g, of which Saturates 14.9 g. Carbohydrates: 56.9 g, of which Sugars 48.9 g. Protein: 4.0 g. Salt: 0.1 g.